Exhibitors who participated in a new programme at the region’s biggest engineering and manufacturing expo have secured more than 10 new contracts worth over £200,000 between them. Twenty-one companies from across County Durham signed up to the very first Incubator Zone at the 2017 Durham Oktoberfest event. And now, just over two months since they showcased themselves to an audience of almost 1,000 people, seven exhibitors have confirmed they’ve already converted leads into business. They include Shred Direct, whose owner Graeme Carter completed a project with a North East engineering company and has quoted for two more contracts; Peterlee security and storage company Steadfast Group, who are on the verge of converting two new sizeable contracts; Bishop Auckland-based bespoke box manufacturer JSB Enterprises, who have add three new companies to their portfolio; and supplier of safety products, Nusafe, who have won work with a large automotive manufacturer. 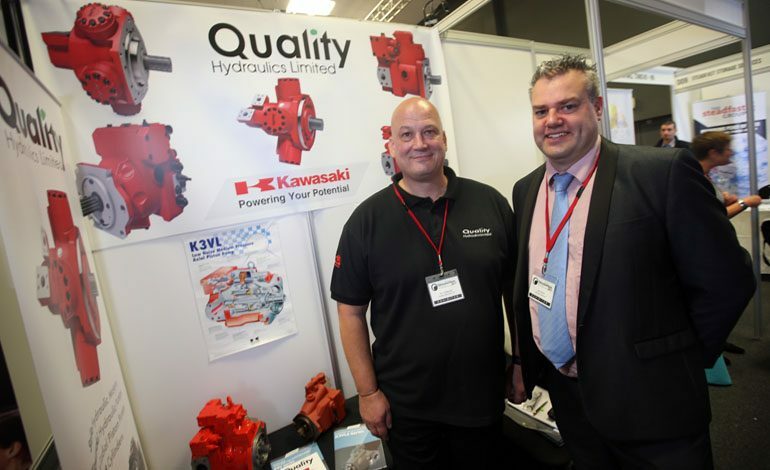 Other Incubator Zone exhibitors who have either won work or are in the process of securing contracts are Aycliffe-based Quality Hydraulics and Bespoke Electrical – pictured above is Ian Outterson from Quality Hydraulics (left) and Lee White from Bespoke Electrical at the 2017 Oktoberfest. The Incubator Zone project is part of the Durham Business Opportunities Programme (DBOP), created to engage companies who had not been involved with Durham Oktoberfest previously. Delivered in partnership with LEC Communications and Design and with European Regional Development Fund funding, the Incubator Zone area enabled new and growing companies, or those who had little or no exhibition experience, to showcase their products and services. Michael Harriett, DBOP business engagement officer, said: “It’s so encouraging that just a couple of months after Oktoberfest, many of the Incubator Zone exhibitors have won work or are actively engaging with potential customers. Oktoberfest 2018 returns to the Xcel Centre, Aycliffe Business Park, on Thursday October 18. For updates on the event, or to book as an exhibitor, visit durhamoktoberfest.org.uk.